So here is my promised book review of “Modern Romance” by Aziz Ansari. This book is amazing in so many ways. First of all, Aziz is one of my favourite stand-up comedians and there is something about the combination of romance and comedy that goes so well (note- the book “He’s not that into you” is by Greg Behrendt a famous stand-up comedian). This book is a quick read and filled with funny anecdotes, personal stories, and shout-outs to various rap artists (Flava Flav!). This book does not really belong in the dating advice or self-help section but is more a book that sets the context for dating. It is written for both men and women, and predominantly focuses on straight middle class relationships. I have to give Aziz credit, he does his homework. He has co-written the book with Eric Klinenberg, professor of sociology at New York University, interviewed hundreds of people and conducted focus groups across five different countries (Japan, UK, USA, Buenos Aires, France). His research and history of dating really put things into perspective. Compared with previous generations, we are marrying later in life, meeting people further away, and with online dating we have more choices than ever before. Love itself has also changed, moving away from a “good enough” marriage based on security and “campionate love” towards “romantic love” where we are looking for our soulmate. It’s easy to idealise the past but after reading this book I feel luckier than ever to be living in a world where I have so much choice and autonomy. As Aziz points out “finding someone today is probably more complicated and stressful than it was for previous generations- but you’re also more likely to end up with someone you are really excited about”. Aziz comprehensively explores online dating and emphasises that online technology should be treated not as dating but as an introductory service. Dating sites and apps can introduce you to someone new you might not have met in person… but you still have to meet them and start dating for real. His warning with online dating is that we can start to view dating as online shopping and people as products to easily judge and discard. Aziz says to “treat potential partners like actual people, not bubbles on a screen”. This type of respect involves taking the time to write thoughtful and kind messages, having real phone conversations, and getting to real meeting as soon as possible. With so many choices and options, you could be quick to judge and reject someone and not worry because there are 100’s if not 1000’s of options at your fingertips. I have been guilty of this before, dating multiple people and having a string of 1st dates that never lead to anything deeper. Aziz advises “with so many romantic options instead of trying to explore them all, make sure you properly invest in people and give them a fair chance before moving on to the next one”. 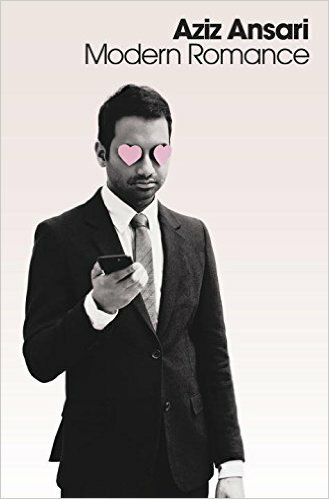 In a myriad of dating self-help books that are about playing games, conning women into bed, and spinning dating into a negative experience, I find Aziz’s perspective to be optimistic, grounded in evidence and endearing. If you are feeling frustrated and confused about dating, and a bit curious about the research behind it so you can impress your friends with statistics (nerd alert! ), this book won’t disappoint. I would also recommend the audio version, because this guy cracks me up! Audio book – great idea! Thanks for the review. I wish, that man is genius. Hope my blog doesn’t disappoint.